When life as we once knew it becomes interrupted, our first instinct is to try and remind ourselves that we are not alone. We must tell someone. Someone must know. The search for an audience commences as the news we didn’t expect and can’t wrap our minds around rumbles its way through us. In an age in which we have instant access to audiences, we too often think only of the audiences that can be reached, rather than how the audiences we reach end up shaping us. Friends and family and co-workers, these most caring of audiences, can sometimes unknowingly hurt us. It’s important that we know that sincerity isn’t always a source of comfort, especially when audiences . . . Ask us to respond to their needs, not ours. “Everything will be okay.” “It’s all going to work out.” “This is part of a larger plan.” We’ve all received these well intentioned, but hurtful responses. Yet, we rarely ask ourselves why these sincere messages hurt so much. These messages hurt because they defy what we are experiencing and feeling. They ask something of us that is seemingly impossible. “Everything is going to be okay” messages ask us to immediately clean up our confusion and disorientation. No delay. Now. Give others what they need to hear, not what we are experiencing. “This is part of a larger plan” messages require us to process everything that has happened, will happen, or might happen, and package our experiences into an easy-to-digest philosophy reducing our fragmented feelings and thoughts into one smooth and flowing statement. Audiences that ask us to translate our feelings and responses too quickly have a low tolerance for uncertainty. They view our anxiety and indecision and confusion as threats to their own world views. Life interruptions are always messy and contradictory. But these audiences respond only to answers—not questions—so anything that we are feeling that can’t easily translate into an ‘answer’ is made to appear angry or defiant or irrational. Unfortunately, most audiences are trained to hear PowerPoint presentations describing information that fits ever-so-neatly into bullet points, not life interruptions characterized by inconsistency and rawness and anger and brokenness and denial. When others ask us to rush the process of making sense of what is happening to us and our lives, we risk responding to their needs of control, rather than our authentic experiences that rarely align with others’ timetables or expectations. Chase only solutions—not understanding. “Okay, here’s what you need to do.” “Have you checked out this treatment, it’s worked for so many people I know.” “What’s your plan? Everyone has to have a plan.” Solution-chasing audiences believe the world is filled with problems requiring solutions. Because these audiences care, their willingness to provide solutions is seemingly a sign of sincerity. Solutions are wonderful except when they are treated as the beginning and ending of engagement. Audiences that approach us only with solutions act as if they know us, or know enough about us that they no longer need to listen to both what we are saying and what we don’t yet know how to communicate. When our feelings and emotions are surrounded by audiences with solutions, care can feel like suffocation. Solution chasers seek to shape us in their image because attaching a ready-made solution to our “problem” reminds them that the world is rational and orderly. When overwhelmed by others’ desire for solutions, we risk thinking about where others need us to be, not where we are. When the world around us makes sense, it’s easy to be surrounded by audiences. We call them friends and family and colleagues. Only when life turns upside down do we recognize what others need from us when we are at our most vulnerable. We must be aware that those around us when we are most vulnerable also shape us. As social creatures, we always bend toward the beliefs and values of those we surround ourselves with even when doing so may too quickly sanitize our confusions and chaos. Today, send a special thank you to the audiences in your life who have the wisdom to be in your company without asking, needing, or demanding forced clarity until you are ready. Today, send a special thank you to the audiences in your life who have the courage to be in your company without clear solutions when all others have long disappeared for fear that being near someone without a solution just might be contagious. Too often, we only celebrate those who stand apart from the rest, rather than appreciating those who stand near us even when doing so might appear depressing and chaotic. These audiences are our heroes because they allow us to be ourselves with others without betraying who we are in the moment. Let’s take this moment to remind them, and us, how important it is to be near audiences willing to gather close enough to authentically listen and connect even in the midst of senselessness. An excellent article! So very very true!!!! I don’t want to hear what I “should” do as I mourn the death of my husband, nor did I want to hear what I “should” do as his caregiver while he was ill; I just want comfort and understanding that this is difficult and I am doing the best I can. I’ve consigned myself to God’s care and guidance, and that should be good enough. And of course the expectation that I am magically “over it” by 14 months is so wrong. I am healing, but far from “over it.” We never get over such losses, but learn to incorporate them as we go forward. This article is so true.. I am always hearing get well soon or quick .. well intentioned .. I used to say it myself … until ..
My husband had a stroke and heart attack and open heart surgery etc etc.. There is no quick fix ..
We settle in for whatever comes next ..
And we get reminded of how soon this one or that one was out of the hospital running marathons in no time ..
We are all different with different health issues .. a simple thinking of you would be great to hear at a time like this..
Or maybe just ask how are things going for the patient and the caregiver … we all will eventually be one someday..
None of us are prepared .. we are just thrown into this .. we have to figure it out moment to moment .. I’d say we do a very good job most times ..
we are all human so everything doesn’t all go according to Hoyle. Such wise and profound reflections, Theresa. Thanks so much for your insights. Thank you, Terri. 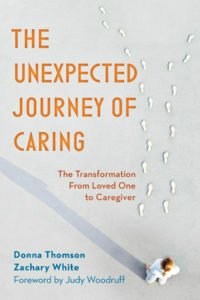 Your words resonate wide and deep with the Unprepared Caregiver audience. I have been trying to find a way to justify my feelings. This did it for me. We/I am so lonely. Most people have deserted us after decades of friendship. I know it is hard from them to know what to say. They do not have to say nothing, just be here for us.